As of this week, New York is finally free to dance! As incredible as it seems, the law that mostly banned dancing in New York clubs and bars has finally fallen, fully 91 years after it first passed. The law that a majority of New York City Council voted to repeal was called The Cabaret Law. Yes, it was heavily enforced since its inception, and increasingly so, especially in the 1980s, as a supposed way of cleaning up the city. The end of the oppression was widely celebrated. The law banned any “musical entertainment, singing, dancing or other forms of amusement” without a license. The process of getting one was so difficult–with a labyrinth of bureaucracy to navigate–that only 97 out of 25,000 bars and restaurants actually had the permit. The law began as a way to crush speakeasies, but The New York Times explains how the law grew more intense over time. Now, you might be asking yourself: how could such a ridiculous law come about in the first place? And why did it take so long to get rid of it. There were two factors. The first was alcohol Prohibition. The laws against Cabarets were an extension of the utterly implausible desire actually to ban the commercial production and consumption of alcohol. Somehow, it was believed that this was possible simply by making the law part of the US Constitution and that the end of alcohol consumption would patch up the American family, end poverty, make people more productive at work, and cause people to turn toward religion to save their souls from perdition. Part of that involved the crackdown on dancing. It’s true that there were religious motivations behind the Prohibitionist movement, but this was not the main factor. Prohibition was part of a general movement to use government as a means of controlling people in order somehow to uplift the population to a new level of enlightenment and moral purity. And this leads directly to the second factor, which is even more insidious. 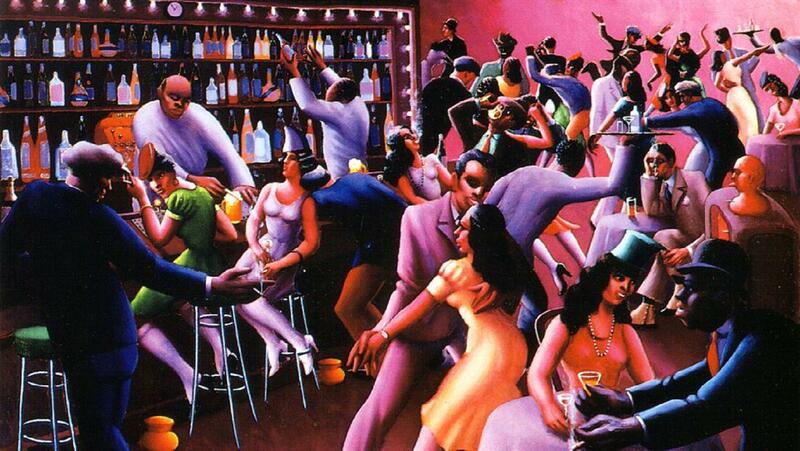 The Cabaret Law was about curbing the influence of the Harlem Renaissance, the artistically and commercially brilliant rise of jazz, dance, and nightlife in the historically black community in New York. This cruel intervention was about more than just “the man” prevailing over embattled minorities. It was designed to stop the race mixing that people associated with dance clubs. Put plainly, many people objected to all contact between blacks and whites, and I’m not just talking about the know-nothing members of the working classes. The extremely weird truth is that nearly the entire intellectual class was enthralled with the science of eugenics as a way of managing demographics. It was designed to keep the races apart and prevent people from having the kind of fun that leads to racial understanding. The trend began in the 1890s and intensified through the decades. Bestselling books on race science warned about the degeneracy of watering down the national gene pool. As I explain at length in my new book, this concern drove far more public policy than issues of sterilization. It led to minimum wage laws to keep the “unfit” from working. It was behind marriage licenses. It led to extreme immigration restriction. Eugenics was ultimately the basis for working-hours restrictions that pertained to women so that their bodies could be preserved for the propagation of the white race. It’s true that most of this history is unknown today. But it is a very real factor in why there were zoning laws, segregation laws, and, yes, business regulations of bars and dancing establishments. The ideology of eugenics was so pervasive in these years that it is essentially impossible to understand the building of the vast regulatory state during the Progressive Era without reference to it. The Cabaret Law was no exception. It had a strong racial foundation to it. It was designed to keep the races apart, shut down clubs with black performers, and prevent people from having the kind of fun that leads to racial understanding. The law was designed to kill an opportunity for people to discover dignity and humanity in other population groups. It was designed to stop freedom of association. The results were yet another blow to the black community, which once again faced another slap down just as things started looking up. The law had a terrible effect on the New York arts scene, in addition to setting back black entrepreneurship. It was done by government, cheered by so-called Progressives, and celebrated by every manner of social uplifters. If your goal is the creation of a racially homogenous state (a goal the alt-right today shares with the Progressives of 100 years ago) in which only one group dominates and others are separated, excluded, and finally squeezed out of existence, it is impossible to accomplish this without some form of business regulation that is ultimately backed by violence. It is commerce that breeds intergroup understanding, association, and mixing. The reason is that commerce, and entertainment, in particular, have always been the setting in which barriers between groups are broken down. It is commerce that breeds intergroup understanding, association, and mixing. The eugenicists understood this, which is precisely why they worked for laws such as the one only now repealed in New York. Of course, these truths are almost entirely suppressed by current-day champions of business regulation. You will never hear reference from a supporter of higher minimum wage laws that the real reason they exist at all was to exclude racial minorities from the workplace. You are not likely to get a progressive to even acknowledge this grim history. Ending the Cabaret Law is a great start. Now let’s take on every other law that was influenced by the evil movement to keep people from coming together, trading, building great lives, and dancing the night away.